New and Renewable Energy, Dr Farooq Abdulla. This info was shared by the Minister during today's Lokh Sabha session. 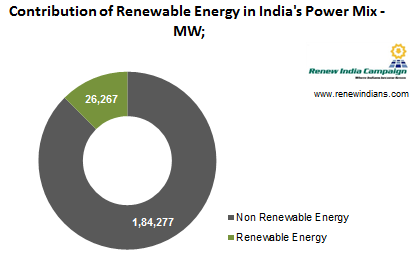 The Cheer full part of the equation is that, India's Renewable Energy installed contribution has increased to 26,267 MW or 12.45% of the total installed Capacity. He also added that India's Twelfth Five Year plan period has a target of installing 30 GW of Grid Tied Renewable power capacity addition, comprising 15 GW from wind, 10 GW from solar, 2 GW from small hydro and 3 GW from biomass. • Preferential tariff for grid tied renewable power in states with the highest Renewable Energy Potential. 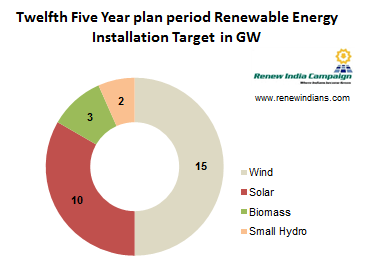 • An RPO for distribution companies from renewable Power Decvelopers. • Guidelines by CERC to SERCs for fixation of preferential tariffs.